CoffeeRoaster and FishWare can be purchased through a business check or money order or by using a Credit Card through PayPal. To use a PayPal payment you must have a valid account with PayPal. ID is required to be sent to Aspire in the form of a Drivers License image by email. Aspire is genuinely interested in the Product being successful in your business. 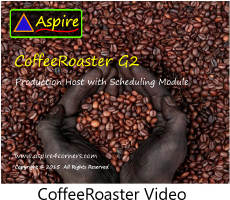 Prior to a purchase of CoffeeRoaster or FishWare Aspire will engage with you to make sure that the product fits your business, consult on existing Hardware or Hardware purchases, and arrange product/staff training. As both CoffeeRoaster and FishWare are low volume custom products Aspire requires a 50% deposit at the time of purchase with the balance due at time of delivery (internet download). 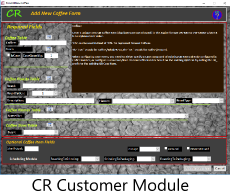 Almost all new CoffeeRoaster and FishWare customers require some customization and testing, this generally takes a couple of weeks or longer depending on the required changes. 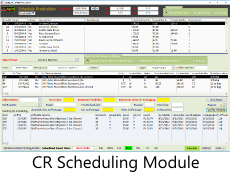 It is expected that some customization will be required for each business and this is included in the price, customization for a specific business that is above and beyond the general product design would be billed separately. 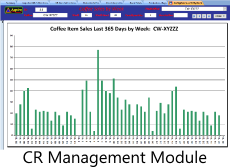 CoffeeRoaster is a custom database solution and requires sufficient lead time to properly configure for individual customers. A 50% deposit payable to Aspire Computer Solutions, LLC is required for custom work. The balance is due upon delivery of software. 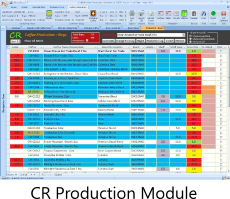 The CoffeeRoaster Production Module includes initial configuration of customer supplied data, preliminary testing and live internet based training. This CoffeeRoaster G2 configuration is designed to display Roast lbs for PreRoast Blends, PostRoast Blends and/or Single Origin Coffees. CoffeeRoaster and QuickBooks Licensing - QuickBooks treats each CoffeRoaster application that connects to the QuickBooks company file to be a "QuickBooks User" and the computer requires a QuickBooks license. Only 1 Coffee Roaster Production module is required to connect to the QuickBooks Company File, additional CoffeeRoaster workstations can connect to the CoffeeRoaster database without requiring a license to connect to QuickBooks. 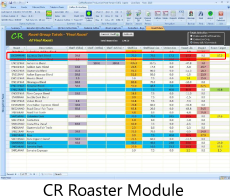 In most cases the CoffeeRoaster production machine can share a QuickBooks license with a local QuickBooks application running on the CoffeeRoaster Production machine. Each CoffeeRoaster G2 customer needs to have a customer specific module written to be compatible with CoffeeRoaster G2 .This module customizes CoffeeRoaster to differentiate Coffees from Non Coffee Items in the QuickBooks database according to the Customer's agreed upon specifications.This info is also used to assist users in entering new coffees into the CoffeeRoaster database.